The county town of Dorset is Dorchester. It lies in the heart of Thomas Hardy's Wessex and the writer named the county town Casterbridge in his novels. 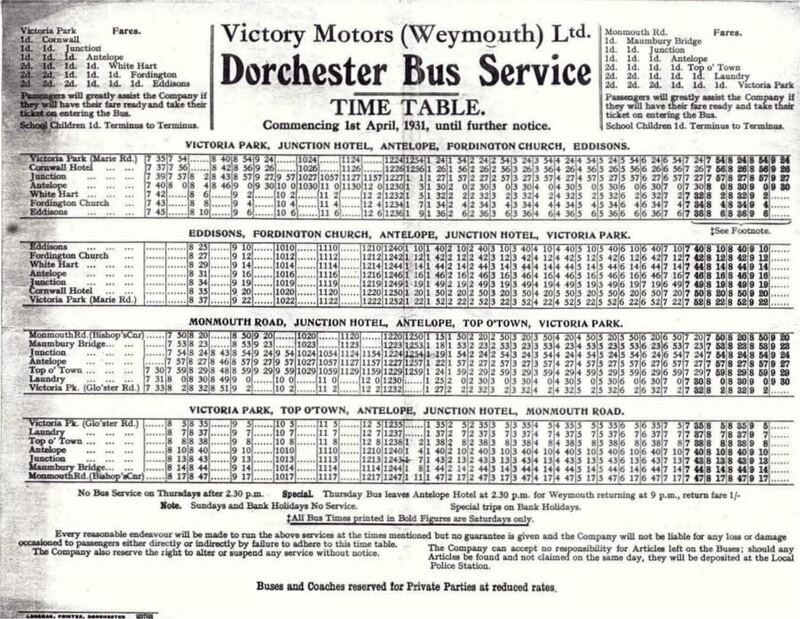 Town buses had been introduced in Dorchester by Victory Motors of Weymouth in March 1931 with two Dennis Dart 20 seater buses operating figure of eight loops from Fordington through the town centre to Gloucester Road and Victoria Park. 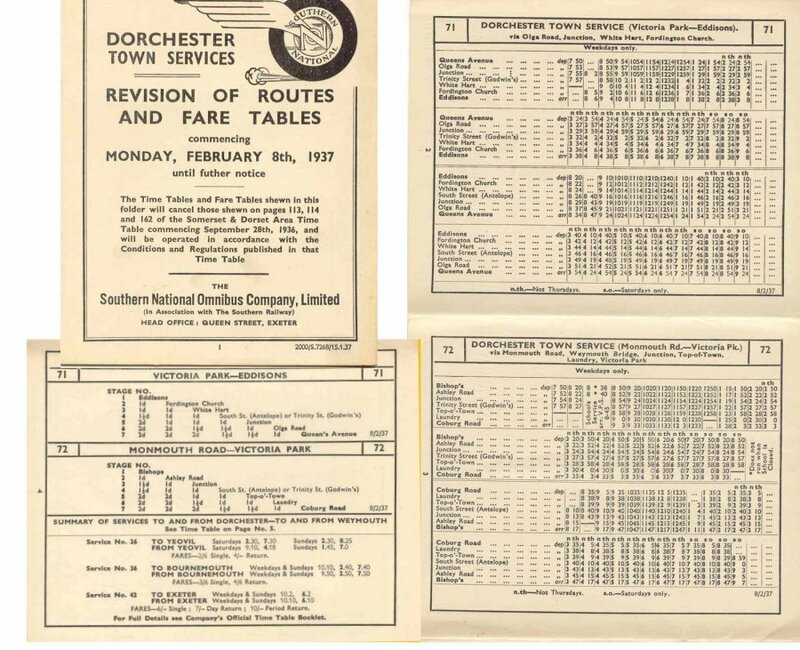 The operating name was changed to Dorchester Motor Services in 1932 and the operation was sold to Southern National in January 1935. 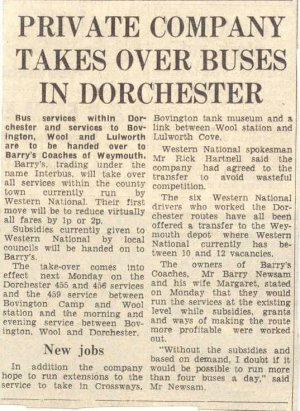 Nearly fifty years later, reorganisation and an implied threat of potential competition on lucrative local routes in the Weymouth area by Barrys led to an agreement whereby the local Dorchester routes passed from Southern National to Barrys Coaches of Weymouth in 1982. The fleet name of Interbus was chosen by Barrys for the new independent operation, which replaced National routes 455 and 456 (Dorchester town services) also route 459 (Dorchester-Wool Station -Bovington Camp). Some of the off peak journeys on the erstwhile 459 between Wool and Dorchester were now to be provided by Dorset Queen Coaches of East Chaldon, whilst the hourly shuttle from Wool Station to Bovington Camp and the peak journeys running through from Wool to Dorchester were provided by Interbus. Using principally three 1972 ex-Burnley and Pendle Seddon Pennine 46 seaters, working from the Barry's garage in Weymouth, the hourly operating pattern of the five radial arms of the Dorchester town services was reorganised. On the country route to Bovington new links were introduced between Wool Station and Lulworth Cove - a section of route that had been unserved since 1971. And we are still very much in Hardy Country - we have crossed Egdon Heath from Casterbridge to the locale of Tess of the d'Urbervilles. 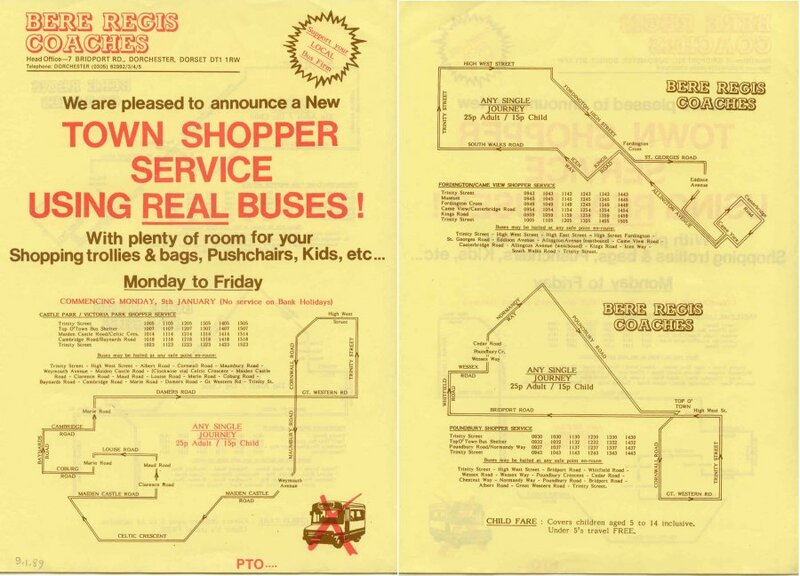 These routes were operated by Interbus with full size single deckers from July 1982 and ran for five years until October 1987. But following deregulation of buses in 1986, Southern National came back to Dorchester with a new minibus network in April 1987, and competed with Interbus. There was insufficient traffic for two operators so Barrys took the decision to withdraw from Dorchester and concentrate on their contract and private hire operations in Weymouth. But Southern National were not to have it all their own way for long as in January 1989 Bere Regis Coaches also started a Dorchester town service but with full size vehicles again. As soon as they had wandered about they could see that the stockade of gnarled trees which framed in Casterbridge was itself an avenue, standing on a low green bank or escarpment, with a ditch yet visible without. Within the avenue and bank was a wall more or less discontinuous, and within the wall were packed the abodes of the burghers. The lamplights now glimmered through the engirdling trees, conveying a sense of great smugness and comfort inside, and rendering at the same time the unlighted country without strangely solitary and vacant in aspect, considering its nearness to life. The difference between burgh and champaign was increased, too, by sounds which now reached them above others--the notes of a brass band. The travellers returned into the High Street, where there were timber houses with overhanging stories, whose small-paned lattices were screened by dimity curtains on a drawing- string, and under whose bargeboards old cobwebs waved in the breeze. There were houses of brick-nogging, which derived their chief support from those adjoining. There were slate roofs patched with tiles, and tile roofs patched with slate, with occasionally a roof of thatch. The agricultural and pastoral character of the people upon whom the town depended for its existence was shown by the class of objects displayed in the shop windows. Scythes, reap-hooks, sheep-shears, bill-hooks, spades, mattocks, and hoes at the iron-monger's; bee-hives, butter-firkins, churns, milking stools and pails, hay-rakes, field-flagons, and seed-lips at the cooper's; cart-ropes and plough-harness at the saddler's; carts, wheel-barrows, and mill-gear at the wheelwright's and machinist's, horse-embrocations at the chemist's; at the glover's and leather-cutter's, hedging- gloves, thatchers' knee-caps, ploughmen's leggings, villagers' pattens and clogs. This competition in Dorchester is now just a memory. The minibuses continued, operated for some years by First Dorchester, the new owners of Dorchester Coachways, who succeeded Bere Regis Coaches when the latter downsized and withdrew from west Dorset in 1994. Dorchester Coachways was established as part of the Cawlett group, who also owned Southern National. Now all are in the First group of companies since 1999. The proprietors of Barrys Coaches, Mr and Mrs Newsam, were also at the time the proprietors of the Stanbridge and Crichel business, based near Wimborne in Dorset. Barrys were well established in the private hire and contract business from their operating base on the outskirts of Weymouth, and had started several market day type services in 1980, from Wyke Regis via Portesham and Abbotsbury to Dorchester on Wednesday, and also from Littlemoor via Osmington to Dorchester, again on Wednesday. Another route linked Weymouth to Bridport on Saturday, via Abbotsbury, Long Bredy and Litton Cheney on Saturday. These routes were to continue long after the withdrawal of the Interbus operation. 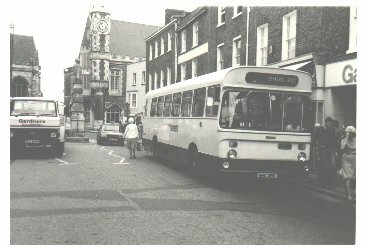 Further changes were to come and the operation of the town routes in Dorchester passed in 2003 to Coach House Travel of Dorchester, but with simplified circular routeings, and a basic hourly service between 0900 and 1400 on three loops through the town. There was a considerable reduction in service outside of shopping hours and no service at all on Saturday afternoons. The Manor Park route had less frequent service than the others. 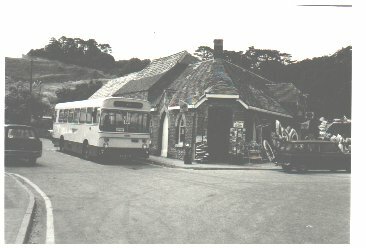 Coach House travel also operated between Dorchester, Charminster, Charlton Down and Forston (as route 007!). This was a continuation of the erstwhile Herrison Hospital bus of years gone by. Barrys Coaches voluntarily withdrew from stage carriage bus operations altogether in 2003, including their own original Wyke Regis - Dorchester route, subsequently operated by Sureline of Portland. The area to the east of Dorchester, where the Southern National 459 used to run to Wool and Bovington - replaced by Interbus amd Dorset Queen, and later served by a grant funded improvement of service with the introduction of Dorset Transit 102/103 routes hourly from Dorchester to Lulworth, Wool and Bovington in 1999, which in turn was operated by First Southern National - saw further alteration from January 2006. There continued to be an hourly service from Dorchester to Broadmayne and Crossways (route 101), with a single journey morning and evening workers service extension as far as Chaldon. 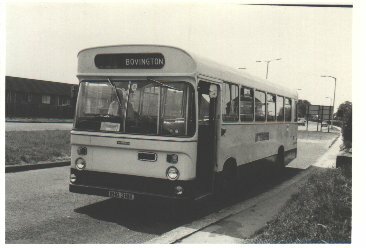 But apart from Wool to Bovington schools journeys the rest of the area, including Bovington, Wool, Winfrith, Owermoigne and Lulworth was then served by a part scheduled part demand responsive service (at inception available only to registered users who had pre-booked their journey, although this irksome deterrent to travel was subsequently abolished). This was operated by community transport operator Nordcat (NORth Dorset Community Accessible Transport) of Sturminster Newton. April 2011 saw a return to normal timetabled operation on 103 between Bovington, Wool, Lulworth and Dorchester when Damory Coaches took over the route at request of the county council following the operational difficulties experienced by Nordcat. After retendering the Damory presence expanded to include the hourly Dorchester - Crossways 101 from 25th July 2011, taken over from First. In 2015 the 103 from Bovington, Wool and Lulworth to Dorchester still ran, but reduced to just one market journey on a Wednesday. 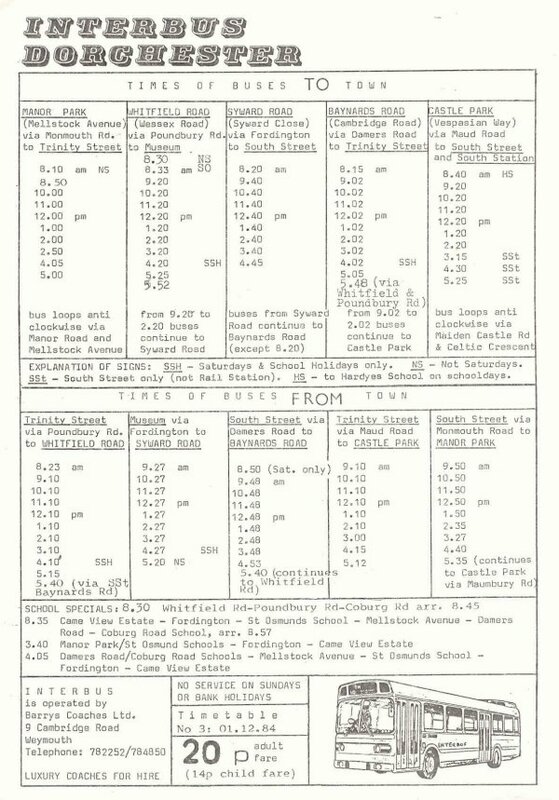 Damory still provide the 101 hourly to Crossways, and they operated two circular town services in Dorchester (routes 1 and 2) as well as the half hourly 6 to the new Poundbury development to the west of the county town (often operated by an electrically powered bus). With severe cut backs in bus service subsidy by the county council (even on one day a week market day shoppers services affecting many villages) the 103 disappeared in June 2016, with further change from 1st August when the operation of the town services 1, 2 and 6 was taken over from Damory for direct operation by the county council itself. 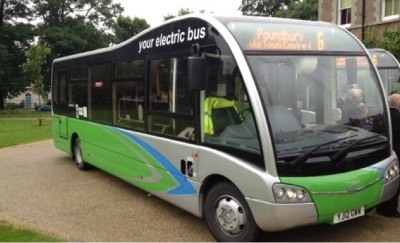 From July 2017 the 1 and 2 reverted to Damory Coaches operation, albeit on a limited 'between schools' basis only whilst the 6 and its electric buses remained with the county council. The first three pictures below were all taken on the first day of operation by Interbus, Monday 21st July 1982. The three relatively uncommon rear engined Seddon Pennines were RHG 316K, 318K and 319K. Two other vehicles carried the Interbus livery of cream with mid-brown and red-brown relief. These were Bristol / ECW LH6L 41-seater VMO 233H (originally with Thames Valley later Alder Valley) and Bristol / ECW RELL6G 49-seater DRX 625K (originally with Alder Valley).